In cards of the Tarot, note that no guessing is not giving a clear answer. Maps are only indicative of the possible scenarios and help you make the right choice. But the final decision always remains with a person. So, you picked up a deck of Tarot – naturally, the first thing you wonder which of the cards of the Tarot are "yours", i.e. they are of greatest value to you. All 22 cards of the major Arcana, there are three that will have the greatest impact on the destiny of man. This card: Personality, Character and Growth. Let us, step by step, we explain how to identify each of them. Fold year, month and day of your birth. In the end, you will receive a four-digit number. Cross-sum of all digits of a given number and will show you the exact map of your Personality. This card symbolizes your behavior, appearance and the impact You have on others. Calculate the value of the cross-the sum of your cards Personality. It will show you on your map Character. Map Character reflects your inner nature. Calculate the cross sum of the digits the day and month of your birth with the sum of the digits of the current year. This figure will show you on your map of Growth. This map reflects the development of your personality and changes from year to year. We have to turn to reference books and to know the interpretation of your cards! 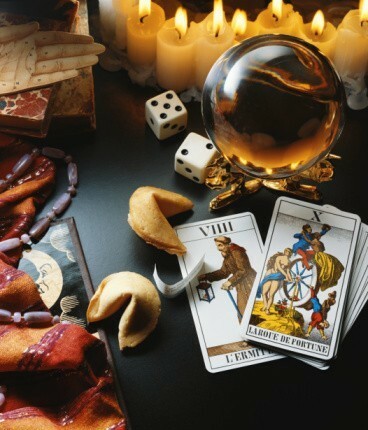 Tarot is one of the oldest and most popular card system. To date, debate rages about when and where the first Tarot deck. Most researchers are inclined to believe that the origins of Tarot are hidden in knowledge should be sought in Ancient Egypt. Like it or not – no one knows, but one thing is clear – ancient, medieval and now modern Europe became heir to ancient knowledge.